Northridge, CA. There were lots of good vibes, not to mention some friendly apparitions, circulating through the Valley Performing Arts Center Wednesday night, as the Monterey Jazz Festival All-Stars brought their tour to the campus of Cal State Northridge. 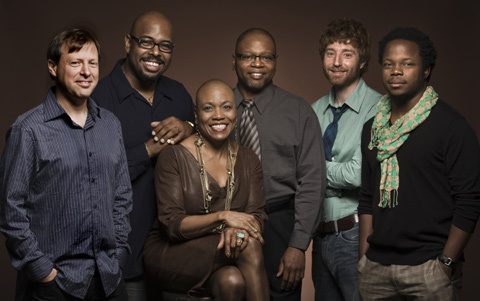 The sextet, which had closed the curtain on the 55th MJF last September, featured vocalist Dee Dee Bridgewater, the world class rhythm section of Benny Green, Lewis Nash and musical director Christian McBride, and a front line of Chris Potter on tenor sax and young trumpeter Ambrose Akinmusire. As they did at Monterey, Dee Dee Bridgewater and McBride opened with a duet, this time Billie Holiday’s “My Mother’s Son-In-Law.” Bridgewater lithely covered McBride’s fingerings, giving the song an intimate, conversational feel that invited the audience into the performance. Throughout the evening the group would split into various permutations – duets, trios, a stunning piano solo to open the second set by Green – as they explored the many nuances of improvisational music. In a “Super Group” of this sort, you never know who will stand out on any given night, and on this evening it seemed Benny Green was charged up right from the start. His work on Dizzy Gillespie’s “Tanga,” the group’s first trio presentation, was inspired. He subtly shifted tempos, his right hand dancing over the keyboard, while across the stage Lewis Nash was pulsating with sticks and brushes. As for McBride, we sometimes forget, for all his versatility, what a terrific trio anchor he is, and he would turn the format on its ear later in the evening. Chris Potter and Ambrose Akinmusire provided robust counterpoints for the group, giving Bridgewater some added oomph (not that she needed much) on “All of Me” and Horace Silver’s “Filthy McNasty.” Potter, who can reach out to the edges of Coltrane-inspired territory, stayed mostly straight ahead with this group. Akinmusire, the ascending star who was the MJF Artist-In-Residence in 2012, provided some spirited riffs, and teamed with Potter on his haunting composition “Henya” in the second set. The trumpeter had some terrific soloing as the concert progressed, but it would have been nice to see him take command of another tune on his own, whether a more familiar ballad or a hard charger, just to give the audience a taste of his potential as a leader. As readers of this space know, I think Dee Dee Bridgewater is on the short, short list of the best vocalists around. Last night she did a lovely version of Thad Jones’s “A Child Is Born,” softly modulating the rarely heard lyrics, with the trio backing her up in spare accompaniment. Later, in the second set, she reached for the opposite end of the spectrum, interpreting “God Bless The Child” with a gospel verve that would have made Aretha Franklin or Mavis Staples proud. The audience, which had a substantial and appreciative segment of CSUN students, (many of them no doubt from their award winning big band) was on its feet. Benny Green, as noted earlier, walked out alone to start the second set. He set up his extended solo with the chords of “The Man I Love,” and dived into an improvisational mode, tossing in quotes from “I Can’t Get Started,” among others, gathering steam and moving to a crescendo before pulling back for the denouement and gently bowing out. I mentioned a couple of apparitions. The first would be the late, great bassist Ray Brown, whose wife, Cecelia, was in the audience. The rhythm trio has all played with Brown and their adoration was evident. On “East of The Sun, West of the Moon,” Christian McBride took the main line on the bass, his notes clear, crisp and swinging. He segued from melody to improvisation, setting the stage for more great stick work behind him from Lewis Nash. In a night full of highlights, the virtuosity of McBride and the trio was a delight. The other apparition was the recently departed Dave Brubeck, who meant so much to everyone at the Monterey Jazz Festival. After blazing through Horace Silver’s “Filthy McNasty” to nominally close the show, the group reassembled and chose one of Brubeck’s less familiar tunes, “Mr. Broadway.” It was a perfect choice to honor his memory, one that avoided the trap of mimicking “Take Five” or “Blue Rondo.” It provided a swinging framework for the front line to go out charging – I thought Akinmusire’s trumpet solo was one of his best moments of the evening. And Dee Dee Bridgewater provided some tender vocalizing, slipping into the lines of “Take Five” at the end, a perfect coda to the performance. As difficult as it is to transfer the ambience and spirit of the Monterey Jazz Festival to another performance venue, the MJF All Stars managed to do it. Now, only eight more months to MJF 56.